Myanmar and the Fundamental Rights of the Rohingyas. Sign of Hope, or Business as Usual? The Rohingyas are a people struck by tragedy. Persecuted in their home country, Myanmar, over 65,000 of them have fled to Bangladesh between October 9, 2016, and January 5, 2017, according to a report from the United Nations Office of Coordination for Humanitarian Affairs. Every day, as reported by The Daily Star, scores of Rohingya people, mostly women and children, are seen dotting a 15 kilometre stretch of road from Ukhia to Teknaf in Cox’s Bazar. Having barely escaped with their lives leaving all their belongings, if any, behind, they are seen begging on and around the roads there. Hoping for someone to stop for a moment, sympathise with their sufferings and lend them some assistance, however trivial it may be. The persecution of Rohingyas in Myanmar is, of course, nothing new. It has been going on for quite a while now. But ever since the attacks on Myanmar’s border guard posts on October 9, 2016, it has again escalated. This is obvious from the fact that, on average, over 1,000 Rohingyas have been entering Bangladesh every day since late last year, while the previous rate of Rohingya influx was 50 a day. From the looks of various reports concerning the latest round of crackdown on the Rohingya people, it seems that some sections of the Myanmarese authority have not been shy in handing out collective punishment to all Rohingyas, regardless of their innocence or guilt. Although some had expected things to improve for the Rohingyas under the stewardship of Nobel Peace Prize winner Aung San Suu Kyi, no such signs are currently visible. In fact, many have gone so far as to criticise her for her nonchalant attitude towards the sufferings of the Rohingyas, particularly her reluctance to condemn the attacks on occasions and for playing them down at times. And this has been the official stance of the Myanmarese government for years now – to deny that the Rohingyas are being persecuted as severely as reports suggest. And in all honesty, with the rest of the world being busy dealing with other problems, it has served them well in avoiding taking any responsibility for the atrocities that have been committed against the Rohingyas. But for how long can the government of Myanmar insist that the Rohingyas are not being persecuted mercilessly? For how long will people avoid asking: “Why then are Rohingyas fleeing Myanmar, risking their lives to resort to begging on the streets of Bangladesh or elsewhere”? Surely begging is not a profession many would take up willingly. Even the UN, which some believe, has played a less than impressive role in helping to find a solution to the Rohingya crisis, seems to have lost its patience with the Myanmar government. The UN Human Rights envoy to Myanmar, Yanghee Lee, for example, said at a news briefing in Yangon that the Myanmar government would “appear less and less credible” if it continues being defensive in response to the allegations of persistent human rights violations against Rohingyas (UN rights envoy: Myanmar losing credibility, Bangkok Post, January 21). 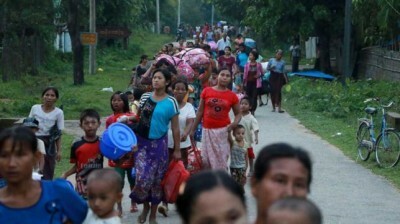 Furthermore, shifting from the UN’s routine position, she said: “I must remind again that these attacks took place in the context of decades of systematic and institutionalised discrimination against the Rohingya population.” Some strong words indeed, which, members of international observant groups have, unfortunately, failed to use with regards to the persecution of Rohingyas in the past. With such strong words coming out even from within the ranks of the UN, is it a sign of hope for the Rohingyas? Will the international community finally take the matter as seriously as it should have all along? It will, of course, be unfair to include all nations under that umbrella. The Malaysian Prime Minister, for example, has already condemned the handling of Rohingyas by the Myanmarese government quite severely. He has even gone so far as to push “the Organisation of the Islamic Cooperation (OIC), the world’s largest Muslim intergovernmental organisation, to apply pressure on Myanmar to end the persecution and killing of ethnic Muslim Rohingyas in the country” (Myanmar urged to end persecution of Rohingya, Bangkok Post, January 19). Encouragingly, he said: “I believe I speak for all neighbouring countries when I say that we want to avoid a repeat of the 2015 ‘boat people’ crisis”, referring to the thousands of Rohingyas who fled Myanmar in boats for Malaysia, Indonesia and Thailand in 2015. Finally, he urged on the whole of South Asia to unite in an attempt to resolve the crisis, warning that it may otherwise explode into something much bigger — such as increasing petty crimes, human trafficking and various forms of militancy — which will obviously harm the region as a whole. But for various geostrategic reasons, many leaders in South Asia have so far refused to condemn the government of Myanmar, despite the possible long term dangers its policies may pose to their respective countries. But with the passing of time, it is becoming clearer by the day that things cannot be allowed to continue as usual. It is time for the other leaders of the region to realise that and heed the warning of the Malaysian Prime Minister and condemn the atrocities being committed against the Rohingyas. Although one could take the comments made by the UN Human Rights envoy to Myanmar as an encouraging sign, what is needed is for the leaders of South Asia to solve the problem through dialogue before it gets much bigger and leads to many more atrocities than what has already been witnessed. It is a challenge which must be faced head on, rather than be criminally avoided, as it has been, despite the tragic consequences.